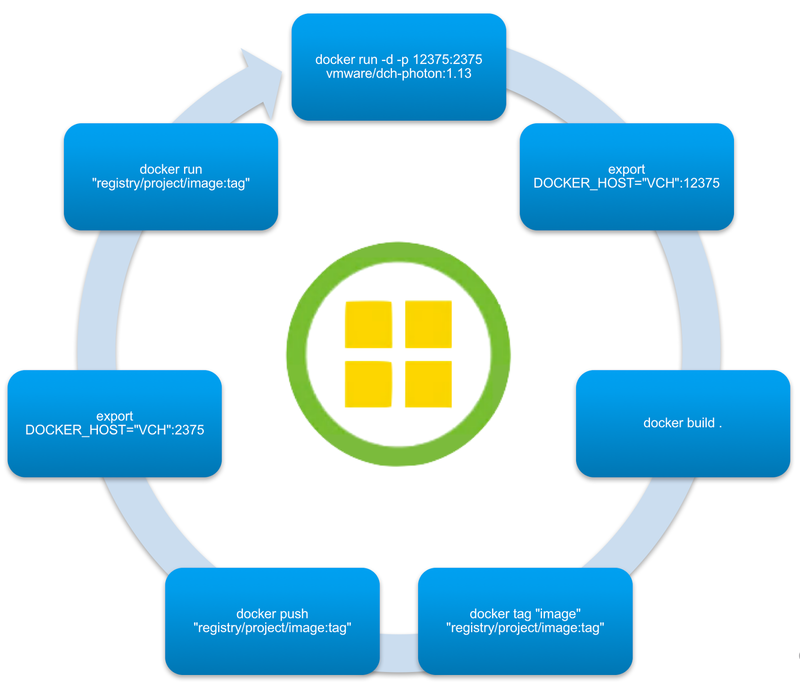 There’s no doubt vSphere Integrated Containers (VIC), is getting more and more powerful at each version, just check the several enhancements and capabilities which were released with version 1.2 and you will see what I'm talking about. Today, I wanna walk you through a developer point of view workflow where we can create an image, storage it on a registry and then run it in production, with just 6 easy steps, all within VIC 1.2.
note: I already deployed a Virtual Container Host (VCH), I'm leveraging Harbor, which is also part of VIC as my registry. If you think you need some help with those steps, let me know and I'll write another post explaining how I did it. Since VIC engine does not support (yet), docker build and docker push I will make use of a Docker Container Host (DCH), a native Docker host leveraged directly from VCH. With the use of port mapping, DCH's services will be available through my VCH on port 12375. Wait until it pulls the image from Docker Hub and starts it. 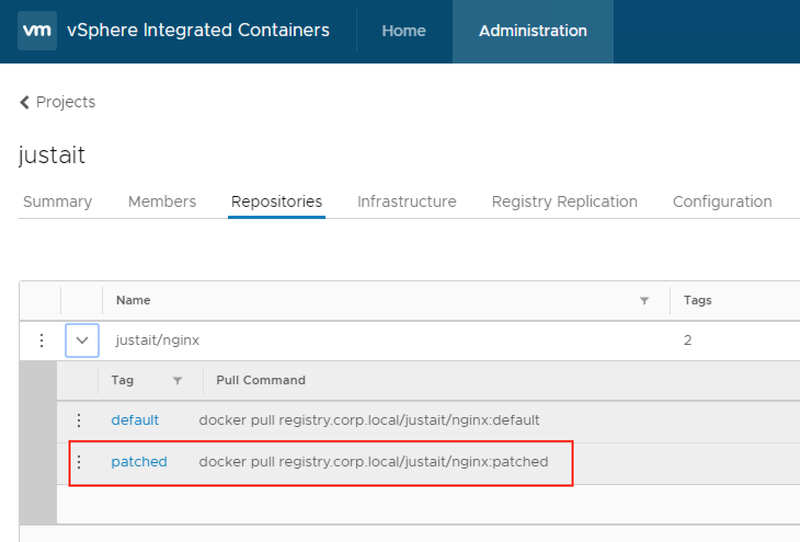 From this point on, I want all my commands to run against the recently created DCH, pointing my docker client to it. not really a required step but it makes things easier. It’s time to build my new image. 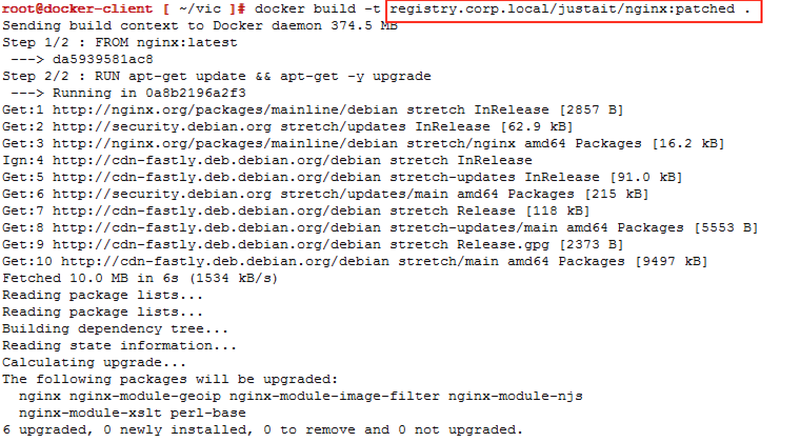 I’m using a simple Dockerfile, which uses nginx:latest image and update it. 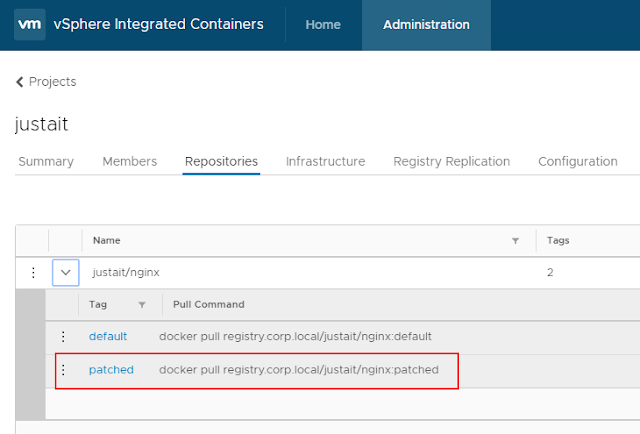 But you can be as much creative as Docker permits, remember; DCH is 100% Docker API compatible. For easier identification, I’m building it and tagging it with a meaningful name. You can tag it something else later as well. 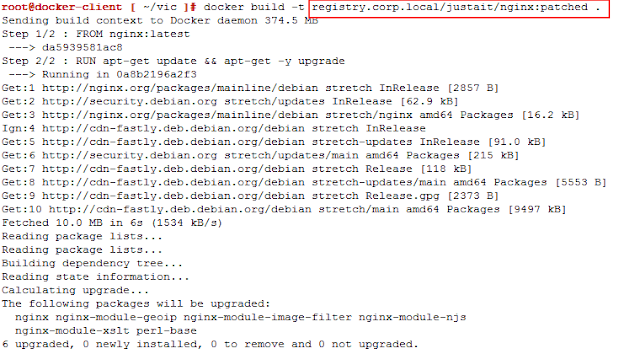 docker build -t registry.corp.local/justait/nginx:patched . it will take some time to pull the image and apply the updates. don't you worry. Now I can push it to my registry, everyone will be able to consume it. I also pushed the unpatched version of nginx, just in case someone wants to use it too. I want all my production containers to run on VIC, where they can benefit from vSphere features like DRS and HA. It’s just a matter of running the container based on the new image. But I'll not just simply run the container, I want to use this unique VIC feature of exposing the container's service directly on the network (Container Network). Here it is, from building an image to running a container in production and all we needed was a VCH. Eduardo, appreciate the quick turnaround. Also, thanks for using VIC v1.2 and the integrated VIC registry. Since the registry is now built in, I'm guessing no need to have a separate instance of Harbor running anymore.